One-sixth scale is a magic place between 1/8 scale and 1/5 scale, where you get a vehicle that is more stable than 1/8 scale and it’s able to use standard batteries and reasonable power systems unlike larger and heavier 1/5-scale vehicles. 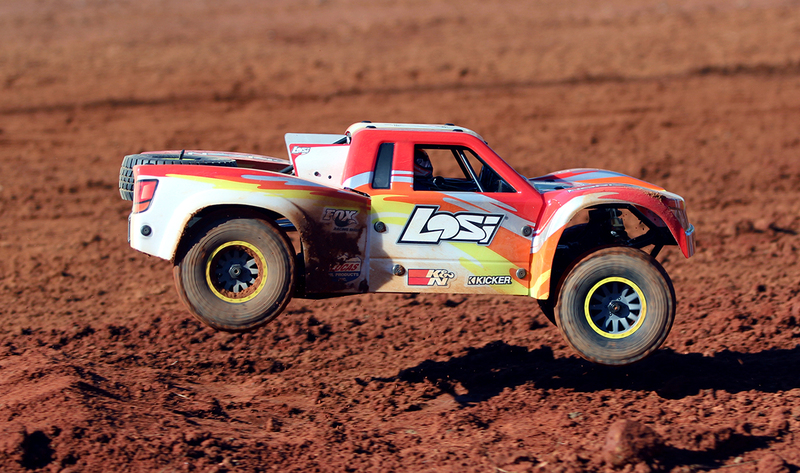 Losi is embracing this new scale, and has blasted the popular Baja Rey with an enlarging ray. The result? The Super Baja Rey. The big bruiser is 40 percent larger than the 1/10-scale model, and has received a significant power boost to keep up with its new dimensions and extra heft. Even with a curb weight of more than 20 pounds, the Super Baja Rey will top 50mph. Want to learn more? Have a seat, and I’ll tell you all about it. Four separate pieces of molded Lexan are used to make up the body, and the pieces are attached to the cage with 16 screws and plastic washers. The body comes painted, and you can choose either a black-green-and-white or a red-yellow-and-white trim scheme when you buy it. Inside is a scale molded Lexan interior with two driver figures. Adding to the scale realism are a pair of bright LED light bars: one in front and a smaller one in the rear. Just like a real trophy truck, the Super Baja Rey uses a 4-link rear suspension to soak up bumps and jumps. The upper links are made out of aluminum rod, while the lower links are injection-molded pieces. 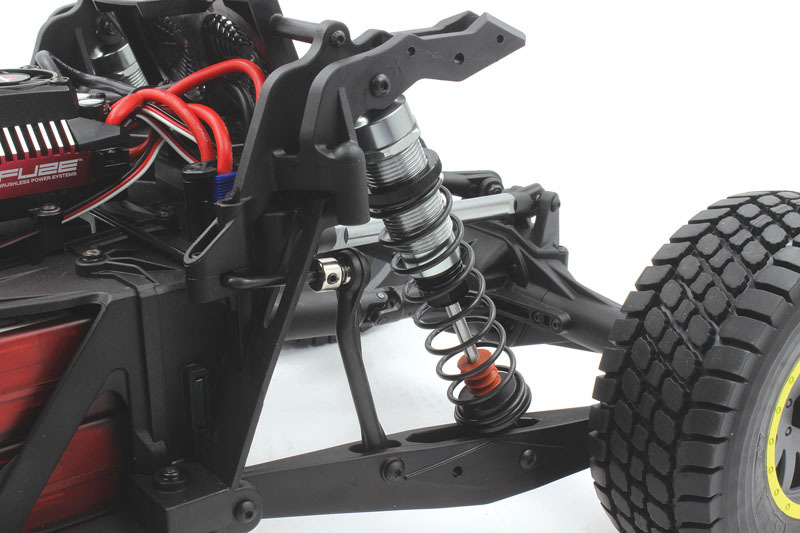 You can run the rear shock in one of two positions, or buy more shocks and run two shocks on each lower link. 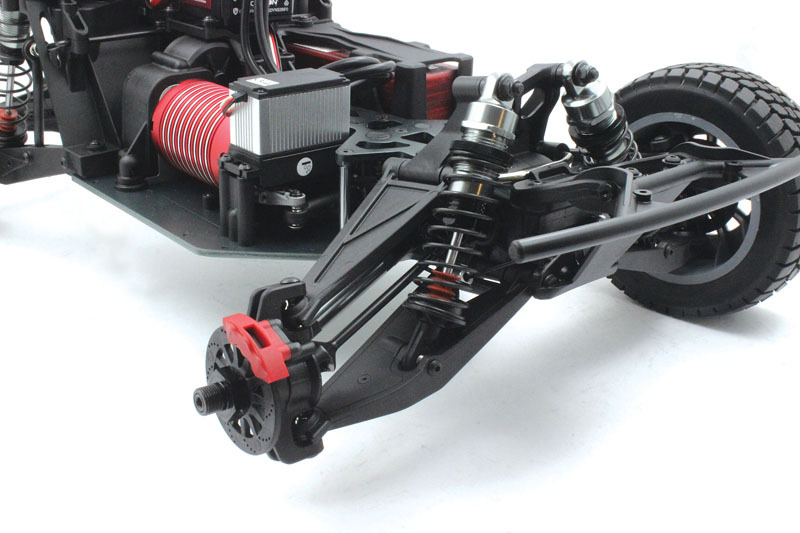 An inboard mounted swaybar helps keep the chassis flat in the turns, but more important it reduces torque twist when power is applied. Damping is controlled by large 20mm-diameter shocks, and they feature threaded aluminum bodies, which make for quick and precise ride-height adjustment. The shock pistons are held in place by small locknuts, and dual O-rings are used to seal the bodies. Bump stops are included, and they soften the blow between the spring retainers and shock body when the shock is fully compressed. On the front end of the Super Baja Rey is an independent suspension that uses upper and lower A-arms similar in shape to the ones that you see on full-size trucks; the hubs are also quite similar. No adjustment for camber has been built in to the front suspension for fine-tuning, and the steering links are “adjustable” but only allow you to increase toe-in. The front end also gets a swaybar to keep the chassis flat. Part of what makes a full-size trophy truck so special is the tubular roll cage/chassis structure that is used to make it into a vehicle. 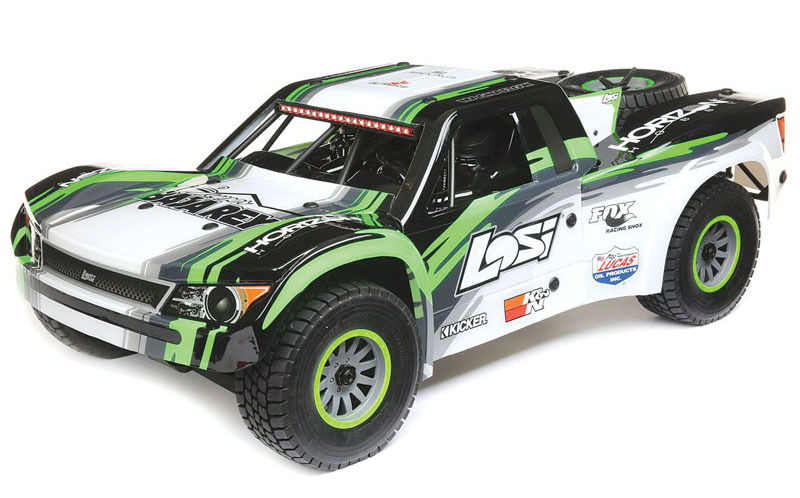 The folks at Losi could have cheated a little and made some tubular pieces that bolted to the body to give the truck the appearance of having a full cage, but they went all out and gave the Super Baja Rey a complete tubular roll cage—and it makes the truck look as good or better when the body is removed. Several pieces of “tubing” are held together with screws and, once together, form a stiff structure. Just as with the Baja Rey, the Super Baja Rey has a shaft-driven drivetrain, but this version of the truck gets front, center, and rear diffs instead of front and center diffs with rear spool. This setup improves performance and lets you fine-tune even more how it drives. 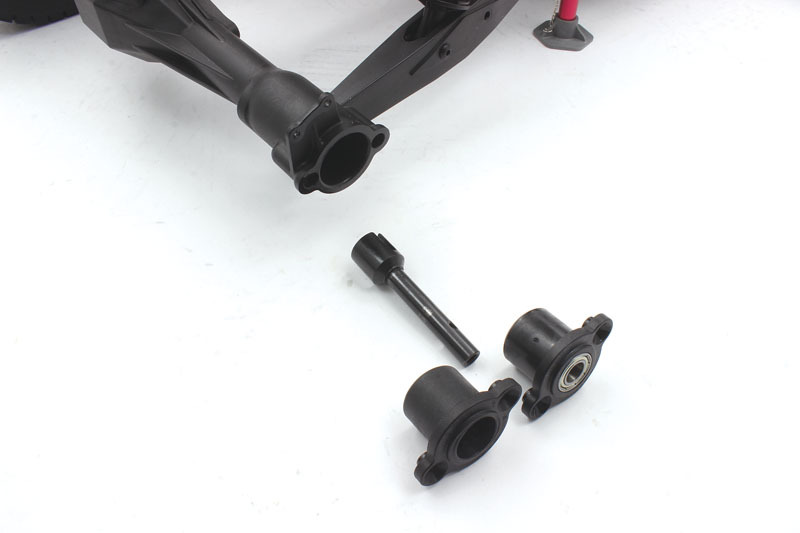 The front differential is connected to the center diff through a dogbone, while the rear axle gets a slider driveshaft that is made up of two steel universals and plastic centers. 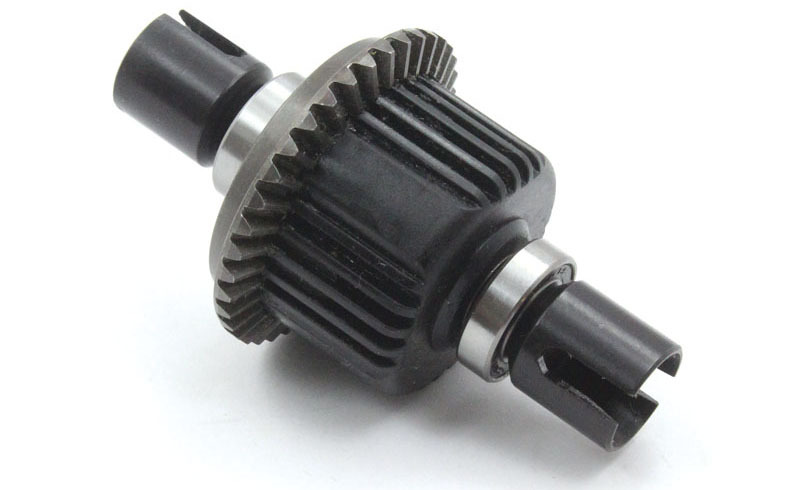 The center-diff gear is protected by a plastic housing, and inside that housing is a stepped gear that joins the pinion gear to the diff gear. 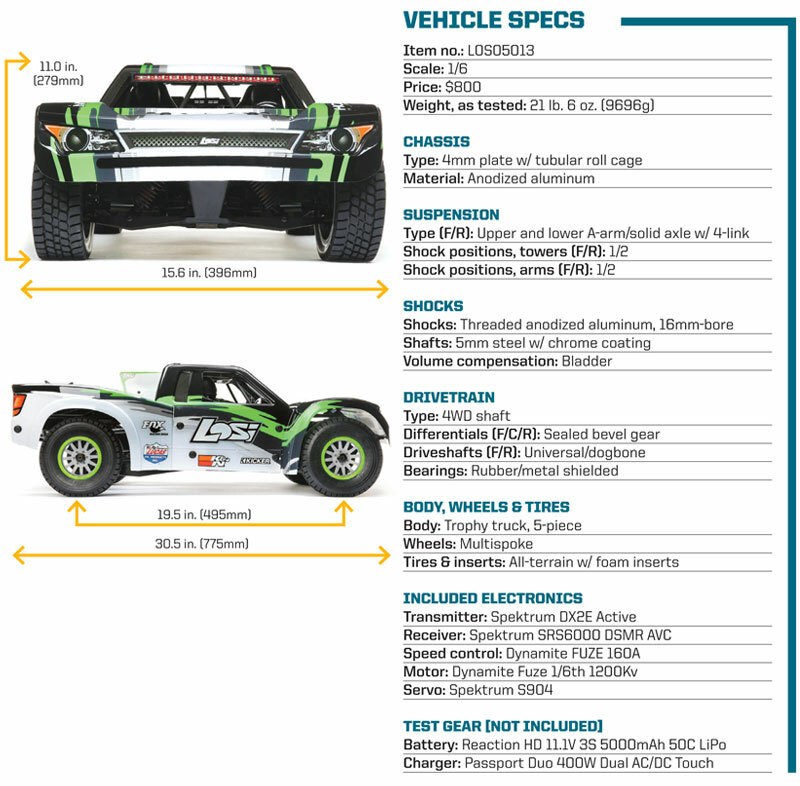 The Super Baja Rey comes with Spektrum’s DX2E Active radio, and it has a little more to offer than other RTR radios. Out of the box, you can adjust AVC and travel, and limit the throttle with the three-position switch on top of the radio. 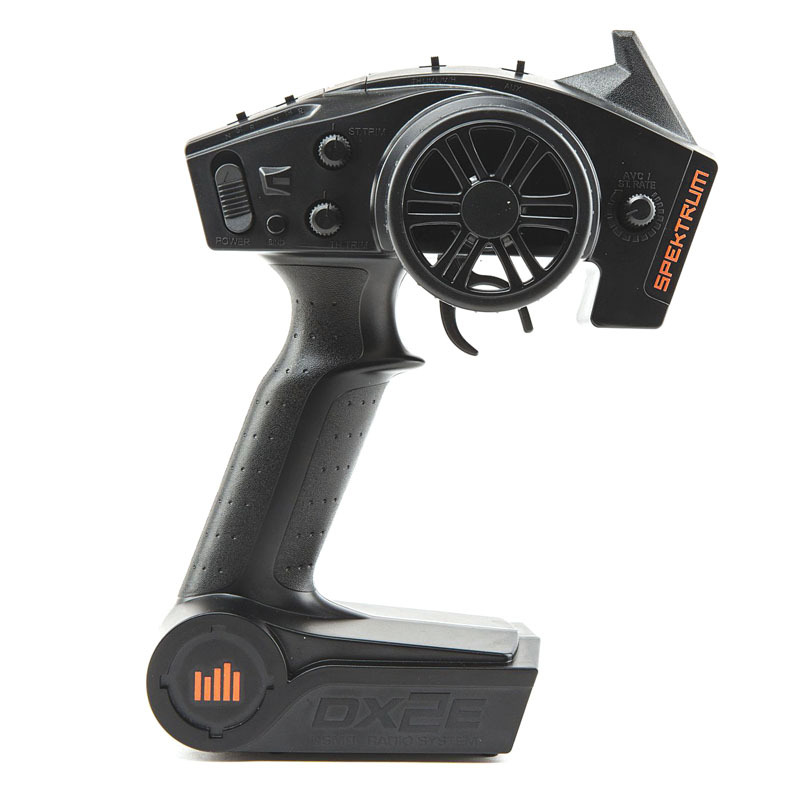 The functions of the DX2E Active radio are expandable by adding Spektrum’s optional speedometer or the Bluetooth module and phone mount. The speedometer will show you the top speed of your vehicle on an easy-to-read LED display, which mounts to the top of the radio. The Bluetooth module and phone mount lets you use the Spektrum Dashboard app, which also shows you top speed and adds motor temp, battery voltage, and more. The motor is a sensorless Dynamite Fuze 1200Kv brushless unit, and it features a ribbed red-anodized can to dissipate heat. It’s 87mm long and has a diameter of 58mm, and large 10-gauge wires with 6.5mm connectors are used to plug it into the speed control. 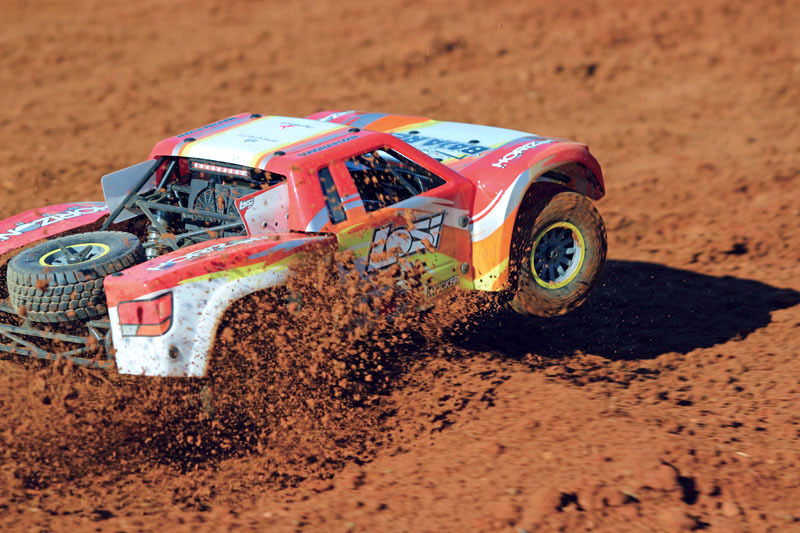 Even though the Super Baja Rey is “only” 1/6 scale, it gets the Dynamite Fuze 160-amp speed control that is used in Losi’s larger and heavier 1/5-scale vehicles. It’s able to handle up to 8S of LiPo power and has a peak current of 1050 amps, and cooling comes from a large heat sink along with a brushless fan. If you grab the optional programming card, you will have the ability to adjust the running mode, max brake force, and punch. The speed control also has lock-up protection, low-voltage protection, low-voltage cutoff, thermal protection, overload protection, and fail-safe. It has a large footprint of 2.8 x 2.6 inches, and mounting tabs are used to securely fasten it to the top plate in the chassis. Take a look at the rear end of the truck and you’ll find a very scale-looking solid rear axle. Inside are a pair of dogbones and some drive cups, and they along with some inserts allow for rear-toe adjustment; this lets you fine-tune rear grip and maintain the scale appearance of the solid rear axle. The axle comes set at 0 degrees, but with optional parts you can set the tires with 3 degrees of toe-in. If you choose to go that direction, the rear disc brakes need to be removed because they will end up rubbing. Getting the cage off the chassis is a little time-consuming because it’s held in place by 12 screws. 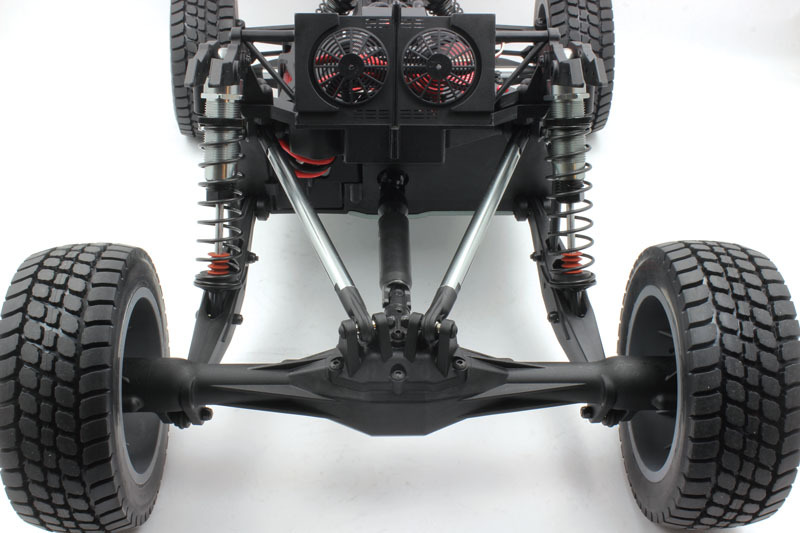 That’s why Losi designed the Super Baja Rey to have an easy-access rear-loading battery tray. It accepts two 3S LiPo batteries or two 2S LiPo batteries, and they lie flat and stack on top of each other. 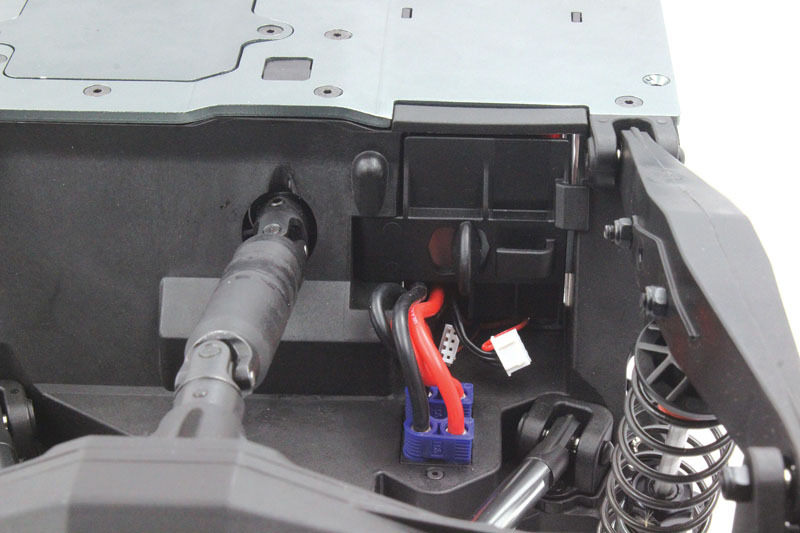 A foam spacer on the battery door keeps the packs from moving front to back in the tray, and a foam spacer is included to take up some of the top gap when 2S packs are used. You can use a single 4S pack, but if you do you’ll have to make a jumper plug that goes into one of the open plugs in the chassis to complete the circuit. One of my favorite features of the Super Baja Rey is the rear-loading battery tray. The cage doesn’t pivot or come off easily for battery installation, so the rear-loading tray makes it easier to get the batteries in and out. The only issue I saw was that the foam spacer on the battery door interferes with the batteries, making getting them in a little bit of a pain. The plugs fit into the connectors on the truck with no issue, and after a push of the power button and a few beeps, I was ready to roll. I punched the throttle, the chassis leaned back, the rear suspension compressed, and the Super Baja Rey blasted down my driveway, spinning the tires with way more power and authority than I expected—this rig moves out like a smaller, lighter machine. Compared to the 1/10-scale Baja Rey, there’s significantly less torque twist, which makes it easier to get straight launches under hard acceleration. I expected a rollover when making hard turns on pavement, but the tires on the Super Baja Rey didn’t grab as much as I expected. Eventually I was able to get to the point where I was able to use all the power on tap and do a little driving once the tires lit up. The truck’s top speed is impressive, and I found it easy to drive while at speed; I attribute that to the size of the vehicle. Even though I could handle the truck pretty well at top speed, I flicked the switch on the top of the radio to the middle position, which limits the throttle to 75%, and I noticed a slight drop in speed and the truck was even easier to drive. The 50% limit position slowed the truck down even more, but it was still pretty fast and not boring to drive. I then drove the truck over to some hard-packed dirt, and I was surprised at how well the stock tires performed on that surface after seeing how easily they slid on pavement. At this point, I was able to see the AVC in action; the truck had a little bit of a wiggle, but it tracked straight and went where I wanted it to go. When I shut off the AVC, I was still able to drive the truck but it was more of a handful and required me to provide more throttle and steering input to keep it tracking straight. Jumping the Super Baja Rey is a little different than a vehicle with an independent suspension. When you hit a jump with this truck, the rear end sometimes donkey-kicks and sends the rear end up in the air. It’s not ideal, but the truck drives through it when it happens; with a small change in driving style, the kick can be reduced. I’m a fan of the 1/10-scale Baja Rey, and the new 1/6-scale version is even bigger fun (literally and figuratively). 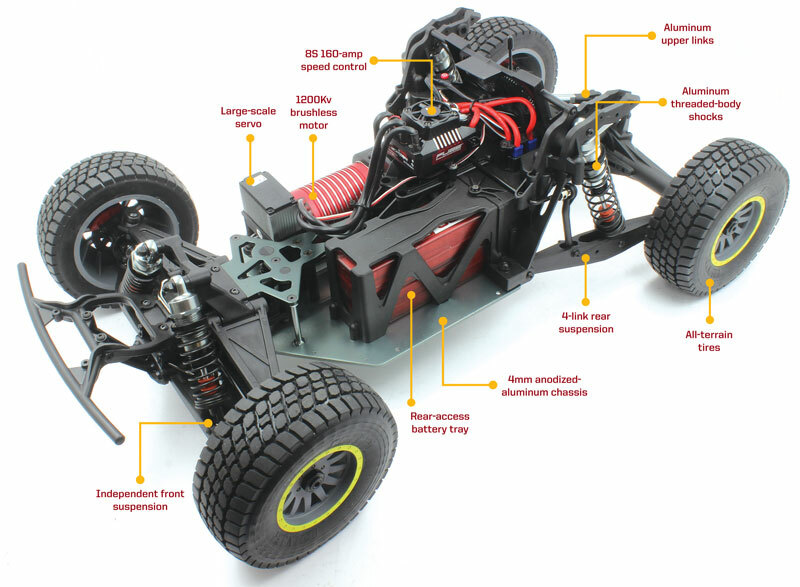 Its much larger footprint and greater mass increases its stability, and the wow factor is huge; by doubling the truck’s size, Losi seems to have quadrupled its OMG effect. 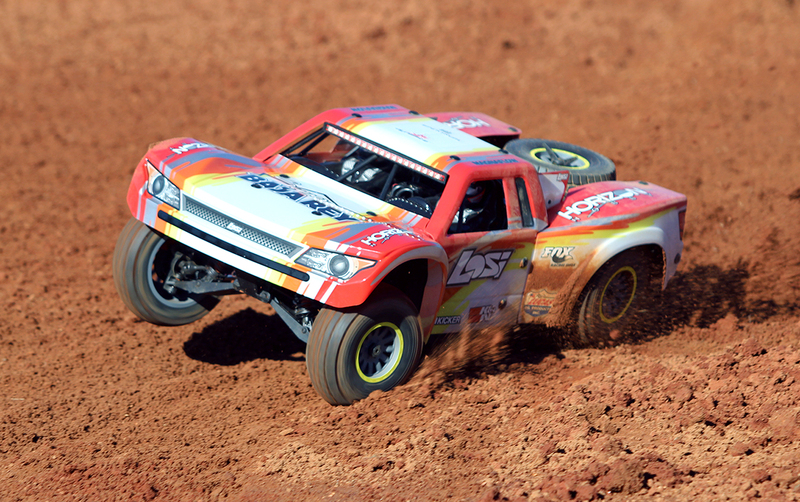 6S power makes this truck very fast, especially for its size, and the throttle-limit switch is a great way to slow down the truck in loose conditions. But even “slowed down,” the Super Baja Rey is a fast and serious machine, so heads up if you’re letting a beginner take a spin. Electric power is great, but I hope that Losi is working on fuel power for this sucker to make the experience even more realistic. Now, when we saw the 1/10-scale Baja Rey, we were presented shortly thereafter with a rock racer based on the same platform. 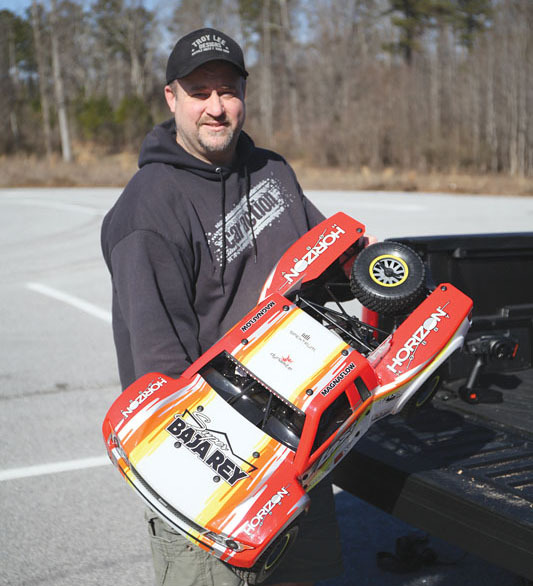 Will a 1/6-scale rock racer be next? I sure hope so!